Autosomal recessive polycystic kidney disease (ARPKD) is the most common heritable cystic renal disease occurring in infancy and childhood. It is distinct from autosomal dominant polycystic kidney disease (ADPKD), which tends to occur in an older population. The clinical spectrum shows a wide variability, ranging from perinatal death to a milder progressive form, which may not be diagnosed until adolescence. [1, 2] See the images below. Autosomal recessive polycystic kidney disease (ARPKD). Abdominal radiograph demonstrates bilateral flank masses in a 3-day-old boy with ARPKD. Autosomal recessive polycystic kidney disease (ARPKD). Excretory urogram of the same patient as in the previous image demonstrates excretion into the bilaterally massively enlarged kidneys (arrows), with distorted pelvocalyceal systems and the vague suggestion of striated nephrograms. Autosomal recessive polycystic kidney disease (ARPKD). 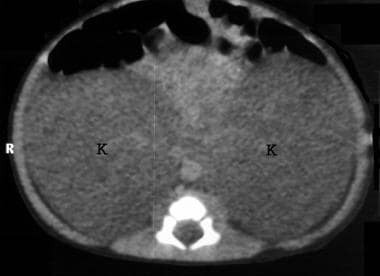 Axial nonenhanced CT scan of a 1-day-old boy with ARPKD shows massively enlarged, hypoattenuating kidneys (K) that occupy most of the abdominal area. Autosomal recessive polycystic kidney disease (ARPKD). 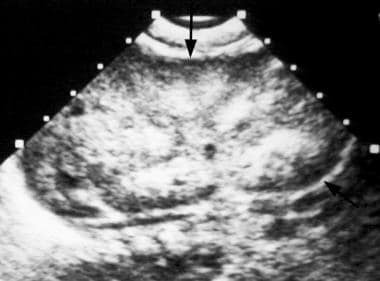 Transaxial section through the same kidney (arrowheads) as shown in the previous image demonstrates a very echogenic kidney with loss of the corticomedullary junction. Foci of intense echogenicity (arrows) may be due to the acoustic interfaces at the walls of tiny cysts or to focal renal calcification. 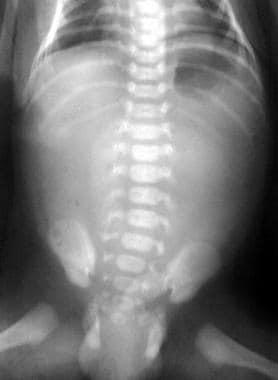 In the neonate, plain abdominal radiographs may demonstrate bilateral flank masses due to nephromegaly; these masses may cause the bowel to become displaced centrally (see the image below). In severe cases, perinatal chest radiographs show Potter syndrome with hypoplastic thoraces and an elevated diaphragm. Occasionally, pneumothoraces or pneumomediastinum is observed. 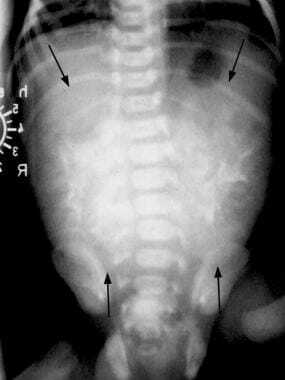 In the older child, hepatomegaly, splenomegaly, and nephromegaly are seen on plain abdominal radiographs. In the neonate, intravenous urograms reveal decreased excretion of contrast material, nephromegaly, and characteristic striated nephrograms due to dilated collecting tubules (see the image below). Contrast material may remain in the dilated tubules for days without visible excretion into the renal calyces. In more severe cases, renal excretion may be absent. Intravenous urography is rarely used in the very young infant. In the older child, intravenous urography demonstrates more rapid excretion and a striated nephrogram. On follow-up excretory urograms, kidneys that were initially enlarged are seen to be smaller or even of normal size. One should remember that intravenous contrast material is nephrotoxic in patients with renal failure. Esophagraphic results can confirm the presence of varices in patients with portal hypertension. The demonstration of organomegaly on plain images is a nonspecific finding. Plain radiographs are also insensitive for the detection of renal calcification in patients with ARPKD. In one study of patients with ARPKD, plain radiographs demonstrated only one seventh of the renal calcifications that were demonstrated on CT scans. Occasionally, renal function in neonates is so poor that their kidneys cannot be visualized with intravenous urography. In the perinatal period, nonenhanced CT scans demonstrate nephromegaly with renal attenuation values approximating that of water. This feature is secondary to the water-containing, dilated, collecting tubules (see the image below). After the administration of contrast material, striated nephrograms are observed; these are due to the stasis of contrast medium in dilated tubules with diminished excretion. In one study, 7 of 9 children aged 9-15 years had had CT scans that demonstrated renal calcifications. These calcifications were always bilateral and diffuse but tended to be more significant in ARPKD patients with moderate to severe renal failure. CT examination may also demonstrate hepatic duct ectasia, varices, and splenomegaly. One should remember that intravenous contrast material is nephrotoxic in patients with renal failure. CT is generally not required in the very young infant. Intrahepatic bile ducts may appear either dilated or normal on CT examinations of patients with ARPKD. MRI may be used to characterize the findings of autosomal recessive polycystic kidney disease (ARPKD) in utero, possibly with better detail than sonography. Fetal MRI demonstrates nephromegaly with low signal intensity on T1-weighted images and high signal intensity on T2-weighted images. This finding is attributed to the fluid-filled, ectatic collecting ducts. An unfavorable fetal position, a large maternal size, and oligohydramnios are some of the factors that can limit obstetric MRI. Magnetic resonance cholangiography is more sensitive than sonography in the detection of biliary dilatation in children with ARPKD. Ultrasonography is often the first imaging modality used to diagnose cases of autosomal recessive polycystic kidney disease (ARPKD). The diagnosis may be suspected because of enlarged, echogenic kidneys on an obstetric sonogram, on a newborn's sonogram obtained to evaluate abdominal masses or renal insufficiency, or on an older child's sonogram obtained to evaluate portal hypertension. The small size of a newborn or child facilitates the use of high-frequency ultrasound transducers that have outstanding resolution. The ability to perform imaging studies without the risk of sedation, intravenous contrast material, or ionizing radiation is an advantage of sonography. Images can be obtained in a number of planes to facilitate interpretation. In some circumstances, Doppler ultrasonography is used to evaluate blood flow. 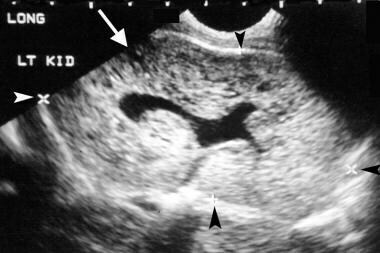 Prenatal sonography may demonstrate echogenic, enlarged kidneys, oligohydramnios, or an empty urinary bladder in severe cases of ARPKD; however, these findings are not demonstrable in all cases (see the images below). Severely affected fetuses with oligohydramnios often have pulmonary hypoplasia, abnormal facies, and high mortality due to pulmonary insufficiency (Potter syndrome). Autosomal recessive polycystic kidney disease (ARPKD). 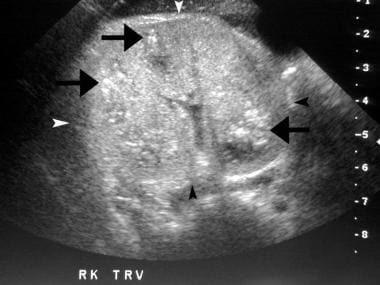 Obstetric sonogram demonstrates massively enlarged kidneys (arrows) in this fetus with ARPKD. The kidneys occupy most of the abdomen. A segment of the fetal spine (S) is seen dorsally. On this sonogram, there is no evidence of oligohydramnios. Autosomal recessive polycystic kidney disease (ARPKD). Coronal image of the kidneys from the same study as in the previous image. The poles of the enlarged kidney are marked by the cursors of the electronic calipers used to measure the length of the kidneys. In the neonate with ARPKD, sonograms usually show symmetric nephromegaly without contour-deforming masses (see the images below). There may be fetal lobation, which is a normal finding. The kidneys are often diffusely echogenic. This has been attributed to reflection of the ultrasound waves from the many acoustic interfaces of dilated medullary collecting ducts, or perhaps to increased acoustic interfaces from interstitial edema. Frequently, there is loss of the differences in echogenicity that distinguishes the renal cortex from the renal medulla). Autosomal recessive polycystic kidney disease (ARPKD). Sagittal sonogram through the enlarged right kidney (arrows) of a 1-day-old boy with ARPKD. There is echogenic parenchyma with loss of the normal hypoechoic medullary pyramids and loss of the corticomedullary differentiation. Note that the kidney contour is regular without focal masses. Autosomal recessive polycystic kidney disease (ARPKD). 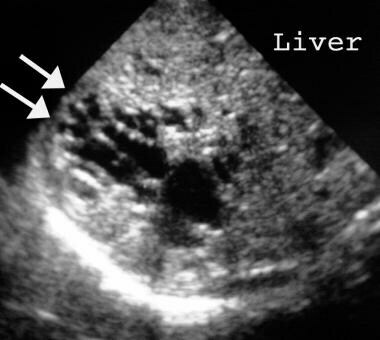 Oblique sonographic image through the liver (L), gallbladder (G), and right kidney (K) demonstrates a kidney that is more echogenic than the liver, without hypoechoic medullary pyramids. This is the same patient as in the previous image. In less severe cases, a sonolucent rim of cortical tissue may be present. This rim has variously been attributed to compressed cortical tissue without duct ectasia, to perirenal fluid, and to elongated thin wall cysts in the peripheral cortex (see the image below). Autosomal recessive polycystic kidney disease (ARPKD). Sagittal sonogram through the kidney of a newborn boy with ARPKD and pulmonary hypoplasia demonstrates a hypoechoic rim along the periphery of the kidney (arrows). Discrete, small sonolucent cysts and, less frequently, larger cysts may occasionally be seen on sonograms of patients with ARPKD (see the images below). Autosomal recessive polycystic kidney disease (ARPKD). Sonogram through the long axis of the left kidney. Arrowheads and electronic calipers mark the contour of the kidney. 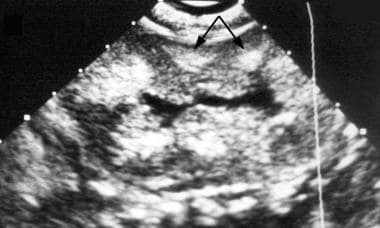 It demonstrates an enlarged echogenic kidney with a discrete hypoechoic cyst (arrow). Autosomal recessive polycystic kidney disease (ARPKD). Sagittal sonogram in a newborn girl with ARPKD shows a massively enlarged right kidney (arrowheads) that measures 10.2 cm in length. They kidney is echogenic with loss of the normal corticomedullary junction. These cysts are more likely to be demonstrated with modern high-resolution equipment (see the image below). A rare but interesting case was reported in which the sonogram demonstrated focal sonolucent macrocysts that contained radiating septations. These corresponded pathologically to radially oriented, dilated collecting tubules. Autosomal recessive polycystic kidney disease (ARPKD). 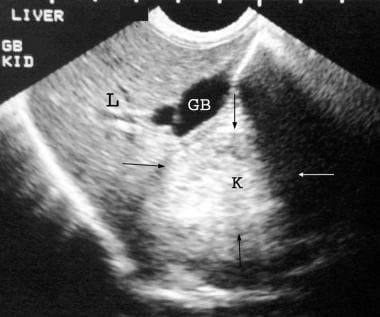 Sagittal sonogram of the 10.6-cm, elongated left kidney of the newborn girl shown in the previous 2 images demonstrates an echogenic kidney with a discrete hypoechoic cyst (arrow). In premature infants with severe ARPKD, the increased echogenicity may be localized to the pyramids, mimicking medullary nephrocalcinosis (see the images below). 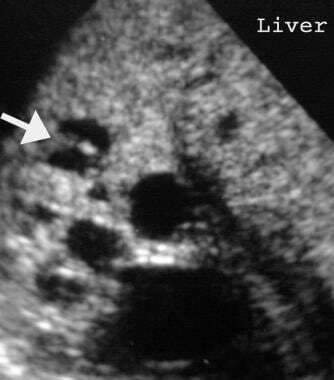 Because liver involvement tends to be less severe in newborns, the livers of newborns with ARPKD usually appear normal on ultrasonography; however, increased hepatic echogenicity or early bile duct ectasia on sonography has been reported. Long-term imaging demonstrates the emergence of hepatic fibrosis and portal hypertension and has been reported to show the development of splenomegaly, often with varices. Autosomal recessive polycystic kidney disease (ARPKD). 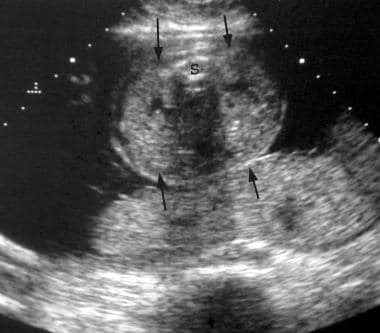 Sagittal sonogram through the other kidney of the newborn shown in the previous image reveals echogenic pyramids (arrows) that mimic medullary nephrocalcinosis. In children and neonates, renal sonography may show increased echogenicity in the kidneys, particularly in the pyramids, loss of corticomedullary junction differentiation, mild to moderate nephromegaly, and (occasionally) dilated cystic-appearing collecting ducts. There are some published data regarding the patterns of serial renal growth and the changing patterns of renal echogenicity in children with ARPKD. One study of long-term survivors reported that renal size tends to peak at 1-2 years of age and then decreases until age 4-5 years, with the echogenicity returning to normal. Another group found little change in the nephromegaly over time and that diffuse hyperechoic foci correlated with the onset of renal failure. Renal calculi may be seen with sonography. Microcalcification in ARPKD is caused by the precipitation of calcium within dilated collecting ducts. This is attributed to decreased urinary citrate excretion and abnormally alkaline urine. Patients presenting in childhood often have portal hypertension. Long-term survivors with ARPKD develop portal hypertension secondary to hepatic fibrosis. The sonogram may show hepatosplenomegaly, echogenic livers, and ectatic bile ducts that contain nodular protrusions or bridge formation across the ductal lumen (see the images). 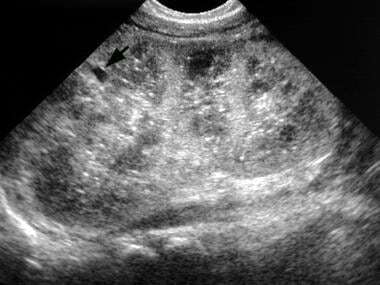 Increased through-transmission of the ultrasound beam is seen beyond the dilated bile-filled ducts. Choledocholithiasis and complicating cholangitis may develop. Autosomal recessive polycystic kidney disease (ARPKD). 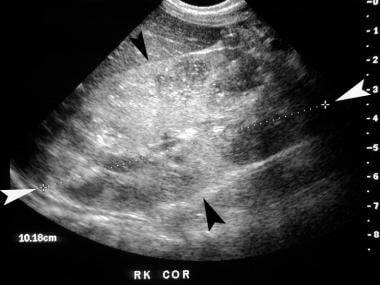 Hepatic sonogram of a child with ARPKD demonstrates both tubular and round dilated hepatic ducts (arrows). Autosomal recessive polycystic kidney disease (ARPKD). Image of the same patient seen in the previous image demonstrates a nodular protrusion of tissue into a dilated hepatic duct (arrow). Ultrasonography is highly operator dependent, and its utility often depends on the skill of the person performing the study and not just the individual interpreting the final images. 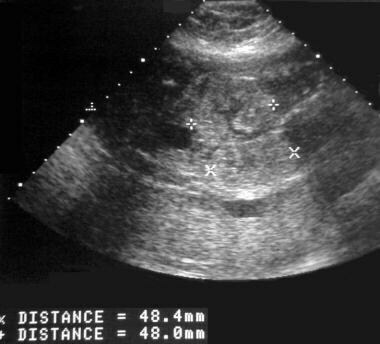 On renal sonography, small foci of intense echogenicity, with or without acoustic shadowing, have been attributed to either microcalcifications or reflections from the walls of multiple tiny cysts (see the image below). Renal calcifications occur in ARPKD but are more frequently seen with CT than sonography. 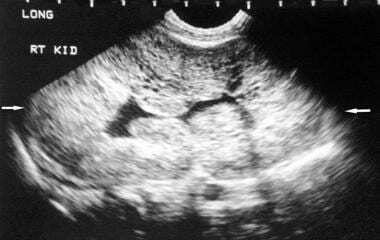 In utero, autosomal recessive polycystic kidney disease (ARPKD) is usually not diagnosed with obstetric sonography before the second half of pregnancy; however, ARPKD is uncommonly suspected on the basis of sonographic results during the early second trimester. Autosomal dominant polycystic kidney disease (ADPKD) and glomerulocystic kidney disease can present in newborns with bilaterally enlarged echogenic kidneys that are indistinguishable from ARPKD. In these cases, the family history may suggest ARPKD. In approximately 10% of ADPKD cases, there is asymmetric renal involvement; is is very uncommon in ARPKD. Other conditions that have echogenic nephromegaly include bilateral renal vein thrombosis, congenital nephrotic syndrome, and diffuse cystic renal dysplasia that are seen in syndromes such as Meckel syndrome, Goldston syndrome, Zellweger syndrome, and Jeune syndrome. Obstetric ultrasonographic findings in ARPKD are not always demonstrable in the second trimester of pregnancy. Sonographic examinations are highly operator dependent, and the findings, when demonstrated, may be nonspecific. Technetium-99m DMSA renal scintigraphic findings are not specific and are variable. Reported patterns include both nonspecific discordant focal defects throughout the kidneys, particularly at the poles, and homogeneous renal uptake. In very young infants renal99m Tc mercaptoacetyltriglycine (MAG3) may show enlarged poorly functioning kidneys, even when the kidneys cannot be demonstrated by excretory urography. In a small minority of patients with ARPKD, results of renal or hepatobiliary nuclear medicine imaging studies are normal. Angiography is not usually required for patients with autosomal recessive polycystic kidney disease. Cramer MT, Guay-Woodford LM. Cystic Kidney Disease: A Primer. Adv Chronic Kidney Dis. 2015 Jul. 22 (4):297-305. [Medline]. Chung EM, Conran RM, Schroeder JW, Rohena-Quinquilla IR, Rooks VJ. From the radiologic pathology archives: pediatric polycystic kidney disease and other ciliopathies: radiologic-pathologic correlation. Radiographics. 2014 Jan-Feb. 34 (1):155-78. [Medline]. Rajanna DK, Reddy A, Srinivas NS, Aneja A. Autosomal recessive polycystic kidney disease: antenatal diagnosis and histopathological correlation. J Clin Imaging Sci. 2013. 3:13. [Medline]. [Full Text]. Zerres K, Hansmann M, Mallmann R, Gembruch U. Autosomal recessive polycystic kidney disease. Problems of prenatal diagnosis. Prenat Diagn. 1988 Mar. 8(3):215-29. [Medline]. Liebau MC, Serra AL. Looking at the (w)hole: magnet resonance imaging in polycystic kidney disease. Pediatr Nephrol. 2013 Sep. 28(9):1771-83. [Medline]. Jung G, Benz-Bohm G, Kugel H, et al. MR cholangiography in children with autosomal recessive polycystic kidneydisease. Pediatr Radiol. 1999 Jun. 29(6):463-6. [Medline]. Kern S, Zimmerhackl LB, Hildebrandt F, Uhl M. Rare-MR-urography--a new diagnostic method in autosomal recessive polycystic kidney disease. Acta Radiol. 1999 Sep. 40(5):543-4. [Medline]. Nasu K, Yoshimatsu J, Anai T, et al. Magnetic resonance imaging of fetal autosomal recessive polycystic kidney disease. J Obstet Gynaecol Res. 1998 Feb. 24(1):33-6. [Medline]. Nishi T. Magnetic resonance imaging of autosomal recessive polycystic kidneydisease in utero. J Obstet Gynaecol. 1995 Oct. 21(5):471-4. [Medline]. Sigmund G, Stover B, Zimmerhackl LB. Cystic diseases of the kidney in children: MRI including RARE-MR-urography. Eur Radiol. 1991. 1:27. Nishi T, Iwasaki M, Yamoto M, Nakano R. Prenatal diagnosis of autosomal recessive polycystic kidney disease by ultrasonography and magnetic resonance imaging. Acta Obstet Gynecol Scand. 1991. 70(7-8):615-7. [Medline]. Avni FE, Guissard G, Hall M, et al. Hereditary polycystic kidney diseases in children: changing sonographic patterns through childhood. Pediatr Radiol. 2002 Mar. 32(3):169-74. [Medline]. Blickman JG, Bramson RT, Herrin JT. Autosomal recessive polycystic kidney disease: long-term sonographic findings in patients surviving the neonatal period. AJR Am J Roentgenol. 1995 May. 164(5):1247-50. [Medline]. Herman TE, Siegel MJ. Pyramidal hyperechogenicity in autosomal recessive polycystic kidney disease resembling medullary nephrocalcinosis. Pediatr Radiol. 1991. 21(4):270-1. [Medline]. Nicolau C, Torra R, Badenas C, et al. Sonographic pattern of recessive polycystic kidney disease in youngadults. Differences from the dominant form. Nephrol Dial Transplant. 2000 Sep. 15(9):1373-8. [Medline]. Reuss A, Wladimiroff JW, Stewart PA, Niermeijer MF. Prenatal diagnosis by ultrasound in pregnancies at risk for autosomal recessive polycystic kidney disease. Ultrasound Med Biol. 1990. 16(4):355-9. [Medline]. Slovis TL, Bernstein J, Gruskin A. Hyperechoic kidneys in the newborn and young infant. Pediatr Nephrol. 1993 Jun. 7(3):294-302. [Medline]. Stein-Wexler R, Jain K. Sonography of macrocysts in infantile polycystic kidney disease. J Ultrasound Med. 2003 Jan. 22(1):105-7. [Medline]. Zagar I, Anderson PJ, Gordon I. The value of radionuclide studies in children with autosomal recessive polycystic kidney disease. Clin Nucl Med. 2002 May. 27(5):339-44. [Medline]. Wisser J, Hebisch G, Froster U, et al. Prenatal sonographic diagnosis of autosomal recessive polycystic kidney disease (ARPKD) during the early second trimester. Prenat Diagn. 1995 Sep. 15(9):868-71. [Medline]. Tracey KP, Jen H, Metcalfe JB, McEwan AJ. Autosomal recessive (infantile) polycystic kidney disease demonstrated byTc-99m DMSA renal imaging. Clin Nucl Med. 1991 Nov. 16(11):833-5. [Medline]. Waters K, Howman-Giles R, Rossleigh M, et al. Intrahepatic bile duct dilatation and cholestasis in autosomal recessive polycystic kidney disease. Demonstration with hepatobiliary scintigraphy. Clin Nucl Med. 1995 Oct. 20(10):892-5. [Medline].